I remember sitting at the green formica-topped kitchen table with Mum when I was small, watching her wrap presents. It was a very precise operation. First, the roll of paper was spread out, weighted down at the corners, and the scissors put in front of the roll to stop it rolling up again. The item to be wrapped (the wrapee?!) was then laid on the paper, a couple of centimetres from one edge, and careful consideration was given to the depth of the wrapee – it’s position was carefully adjusted so that there was just enough paper to cover just over half it’s depth. A small pencil mark was made the same distance from its other edge. Then the wrapee was turned over end on end three times, and a small pencil mark made a couple of centimetres from where the wrapee ended up. The wrapee was then carefully set aside. The weights and scissors were removed, and the paper was folded along the length of the roll, at the first pencil mark. A gentle fold was made, and if it was satisfactory, thumbnail pressure was applied to get a nice, sharp crease. Now then – you’re expecting the scissors to make another appearance here, aren’t you? What did appear was the carving knife. It was inserted into the folded paper and with a lovely, whispery noise the paper was cut perfectly. The same operation was then performed at the other pencil mark. Next came the tape – 3 short pieces, not so long that they’d hang off the edges of the wrapee, were cut and stuck lightly by one end to the edge of the table. (Here the scissors made their comeback!). The wrapee was positioned on the paper, and a light ‘test-wrap’ was performed. Small adjustments were then made so that you’d end up with the edge to be taped about a centimetre off-centre. That edge was then folded back on itself sharply. The ‘proper’ wrap then took place, and the first bit of tape applied the nice, neat join. Each end was then folded down, the corners folded in, and the bottom bit folded up – and there was always just enough paper to fold the bottom edge back in under itself to get a clean, sharp, folded edge, rather than a cut edge. The final two pieces of tape were then applied, and hey-presto! One perfectly wrapped present! I don’t remember the addition of ribbons, bows or tags – it was the precise, careful measuring, cutting and folding that stuck in my mind, and Mum’s deft, nimble fingers. Not a scrap of paper was wasted – just enough was used, and leftover bits were carefully rolled or folded for later use. Really small bits were put in the big, flat box that once upon a time had contained chocolates, and that lived in The End Cupboard where at some point later when my sister or I were looking for a small bit of paper with a bell, or a robin or something on it, it would be there waiting for us. 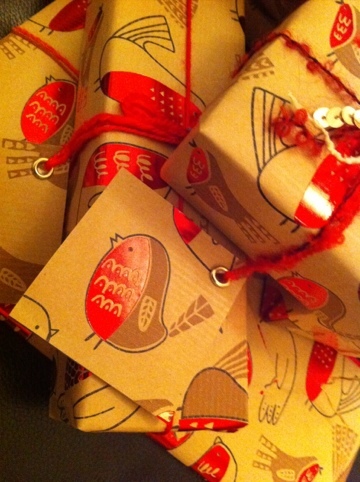 That’s one of the reasons why I love wrapping presents – it reminds me of Mum showing me how, and of watching her do it. For ribbons I used a mixture of rafia (from my own End Cupboard stash!) and some beautiful threads and dyed wool from SpinningStreak. And – of course – it’s lovely to see the appreciation on peoples faces when they’re presented with a gift that has had a bit of time and thought put into the wrapping. And they look great under the tree! Merry Christmas dear readers! I hope you all have a wonderful time! 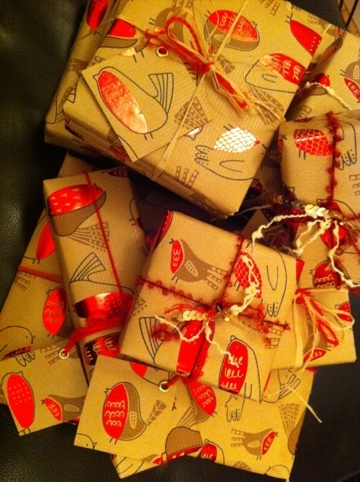 This entry was posted in waffle and tagged Christmas, gifts, Mum, paper, wrapping by stupidcats. Bookmark the permalink. wow! Those are lovely gifts! I do admire such precise wrapping. I start of fwith good intentions to get nice neat packages but it always goes awry!